"Fruity-tutti, peachy-keen, chili-chicken, sweet and serene!" Melt butter or margarine in a large saucepan. Add garlic, pepper, chili powder, lemon juice, lemon rind and Worcestershire sauce. Mix well. Place chicken in a lightly greased 9x13 inch baking dish. Pour butter/margarine mixture over chicken, cover dish and bake in the preheated oven for 45 minutes or until thick parts of chicken are tender and juices run clear. 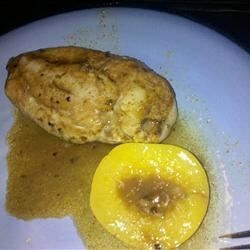 Arrange peach halves around chicken and spoon a little sauce over the peaches. Broil for 5 minutes and serve. A little too much butter as is, but very good flavour. I make this every couple weeks as it quite cheap compared to a lot of other meals. Was ok, a little dry. It says to cook it too long and my husband thought the peaches superfluous - they were there but not really a part of the flavor. My hubby and I both loved this one and it took much less time than I anticipated! I used a 1/2 the butter but it still turned out great. Use the sauce for gravy over mashed potatoes - yum! I thought it was okay but my girl thought it was too lemony (sp) is lemony a word? I dont think I will put this one in the vault. Maybe the trash! An interesting melange of flavors. Definitely don't skip the peaches.